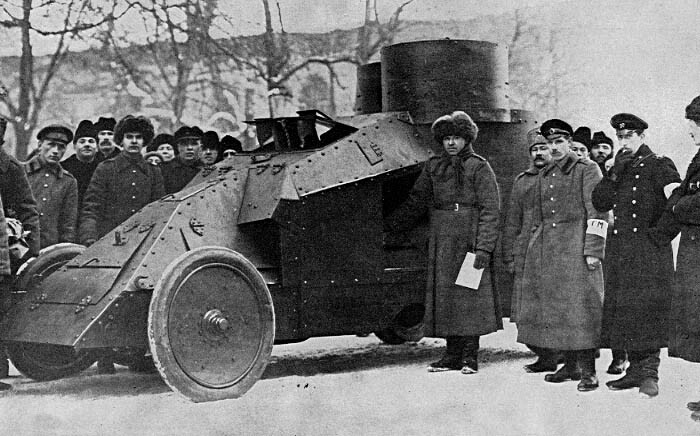 Part One - A Group of City Militia, the Volunteer Police with an Armoured Car. A temporary police force was formed by volunteers who wore white bands with the letters C.M., meaning "city mlitia." They succeeded so well with commandeered armoured cars that by Thursday morning practically all the former police spies were rounded up and the revolutionists were in complete possession of the city, This quick action undoubtedly saved Petrograd from falling into a state of absolute anarchy as thousands of released criminals were roaming around, killing and stealing.